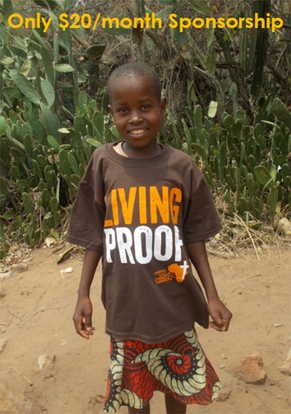 sPONSOR A CHILD FOR $20/MONTH AND HELP THEM BECOME LIVING PROOF! 1. The $20 sponsorship monies will go directly toward evangelistic efforts within our 27 mission schools and toward the forming and operating of the Living Proof clubs. These clubs will focus on Bible learning and leadership development. 2. The sponsoring persons or families will be given a profile of a specific child, including a picture and personal information, and will begin corresponding with the child to encourage him or her to do their best in school, to always attend church, and to be an active participant in Sunday school. We sincerely want our sponsors to partner with HVCM to develop friendships with these precious children, to pray regularly for your child and help lead them to the Savior. 3. $5 per month from the $20 sponsor gift will be set aside in an account to be used for the sponsored child toward high school fees and further education down the road. We also hope to make additional scholarship opportunities available for sponsored children who desire to attend Zimbabwe Christian College. 4. Every sponsored child will be presented with a Bible given to them on behalf of their sponsor. 5. Every sponsored child will also receive a LP shirt, and will participate in LP youth club activities! 6. Although the children will not be given their sponsor’s personal address (only the mission offices will have that information) they will send personal letters back to their sponsors through the mission office in Zimbabwe. It's easy! Just fill out the form below. Don't hesitate to contact our office if you have any issues. Also, if you are interested in supporting more than one student, specify how many you would like to sponsor in the comment section. *You will be taken to an automatic payment page after clicking submit. If you wish to pay by mail instead, simply exit out of the following webpage. WANT THE LATEST INFORMATION FROM HIPPO VALLEY? Copyright © 2018 Hippo Valley Christian Mission, All Rights Reserved.